'Tresawle' at Housel Bay, Lizard is a stunning architecturally designed house in a simply perfect location. 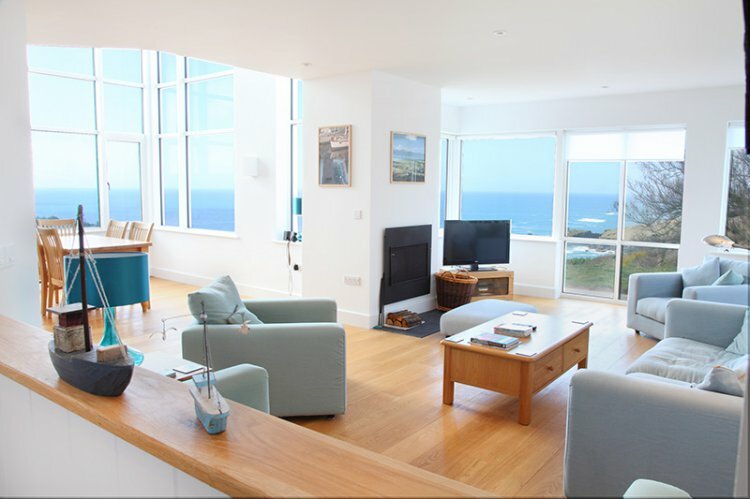 Taking advantage of the breathtaking open views of the sea and coast round to Lizard Point with two storey high glazing. The high quality theme is continued with the solid wood flooring, granite work tops, Super King-size Beds, two lounges and six Bath/Shower rooms in total, plus an extra two toilets, one on each level. Tresawle also has underfloor central heating powered by a ground source heat pump, so it is incredibly environmentally friendly. Approached down an unmade lane (beware in cars with low ground clearance) onto the gravel drive, there is plenty of space for up to four vehicles. The front porch gives some space for coats and boots, although there is another entrance at the side into a large utility area where wet clothes and boots can be removed and dried. On entering the property the first impression is of space and light, followed quickly by the beautiful sea views. The ground floor living area is mostly open-plan, taking advantage of the light provided by the enormous windows. A large lounge area has comfy seating for seven/eight people with a coffee table, open fire, large LCD TV with freeview BT Vision with interactive services and DVD player. A second enclosed lounge has comfy seating for up to five people, coffee table, LCD TV with freeview and DVD player and a table football game. There is Wi Fi throughout the house with BT Infinity. The beautiful well-equipped kitchen has granite work tops and a large central island, a double range cooker with two ovens, grill and 6-hobs with extractor over, dishwasher, large fridge and plenty of storage space. There are two identical dining tables that have five chairs each and can easily be pushed together for everyone to dine together if desired. Also on the ground floor are a separate toilet, a shower room with mixer shower over the large cubicle, with toilet and handbasin, a small utility room with washing machine, tumble dryer and sink, a further utility room with sink, freezer and room for boots, coats, wetsuits etc with access from the garden and finally a nice, bright 'spare' room - ideal for a bit of peace and quiet, to read a book or write those postcards! Upstairs is as impressive as down with every bedroom boasting views of the sea although views from the front two are simply extraordinary. The wooden flooring and underfloor heating are continued on the first floor in all of the five bedrooms. There is also a family bathroom with double-ended bath, toilet, bidet and handbasin with mirror, shaver socket and heated towel rail. Another separate toilet with handbasin and yet another separate shower room with mixer shower are also available on the first floor. Bedroom one is a large dual aspect double room with fantastic views of Housel Bay and Lizard Lighthouse. With a 6' super king-size bed with bedside tables and lamps, built-in wardrobes and a chest of drawers. En suite shower room with mixer shower, toilet and handbasin with mirror and shaver point over and a heated towel rail. Bedroom two also has the fantastic views of the bay, a 6' super king-size bed, bedside tables and lamps, chest and built-in wardrobes. En suite with mixer shower, toilet, handbasin, mirror, shaver point and heated towel rail. Bedroom three is to the rear of the house, a 6‘ super king-size bed, bedside tables and lamps, chest of drawers and built-in wardrobe. En suite with mixer shower, toilet, handbasin, mirror, shaver point and heated towel rail. Bedrooms four is zip and link 3' twin beds can have either a 6' double bed or twin 3' singles. Please advise if super king is required. bedroom five has twin 3' single beds. Both have views of the sea and garden, bedside tables and lamps and wardrobes. Outside is a large south facing patio with garden furniture, there is a further separate patio surrounded by a glass balustrade with views of the coast and sea and good evening sun, an excellent location to soak up the sunset. A large lawned garden leads down to a gate onto the South West Coastal Path which will lead you to Lizard Point in about 15 minutes and onwards to Kynance Cove. In the other direction the famous fishing cove of Cadgwith is about a 60 minute walk. As one of the most southerly houses in Britain, and with the views that it has, Tresawle is dramatic is all weathers, in sun, wind or rain! Lizard Lighthouse marks the furthest southerly point of mainland UK and its fog signal is just audible inside the property during inclement weather, depending on the wind direction. You may also detect the flash, despite the double lined curtains on all front facing rooms. Please ask us before booking if you are at all concerned as deposits are not refundable. Regret no dogs and no smoking please. Rental includes bedlinen, towels, central heating, electricity, WiFi and some initial logs for the fire.